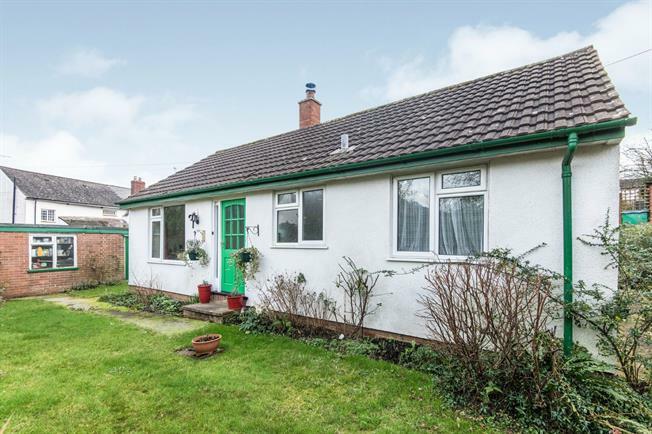 2 Bedroom Detached Bungalow For Sale in Exeter for Guide Price £250,000. An early viewing is highly recommended to make the most of this well presented bungalow which is all on the level. Accommodation comprises a light and spacious lounge, kitchen with enough space for dining, two double bedrooms and a family bathroom. To the outside of the property you will find a garden which wraps around the bungalow and is the perfect area for alfresco dining during the summer months. The property also benefits from a garage, UPVC double glazing and central heating. A light and spacious lounge comprising a fire place containing multi fuel burner, carpeted flooring. UPVC double glazed window to the front and rear aspect. UPVC double glazed door providing direct access to the garden. A range of matching wall and base units with a roll top work surface and tiled splash backs. Space for larder style fridge freezer and washing machine. Integrated oven with four ring electric hob and extractor over. Stainless steel sink with drainer and mixer taps over. UPVC double glazed window to the rear and side aspect. Wooden flooring, radiator. UPVC obscure double glazed door providing direct access to the garden. Space for dining table and chairs. A white and modern three piece suite comprising low level WC, pedestal hand wash basin and bath with electric shower over. UPVC obscure double glazed window to the rear aspect, tiled surround and carpeted flooring. Radiator and wall mounted heater. UPVC obscure double glazed window to the rear aspect, carpeted flooring, built in wardrobe, radiator. The outside of the bungalow benefits from a level garden which is mostly laid to lawn. The garden wraps around the bungalow and is the perfect area for alfresco dining during the summer months. The property also benefits from a single garage with light and power.